Good schools, like happy families, have something in common. Whenever I have visited a school where teachers and children are deeply engaged in learning, I have always found this: a driven ‘teacher-leader’ who invests time in the classroom. Sashikala Imchen and Urmila Chowdhury are two such ‘teacher-leaders’. Their backgrounds and work contexts could not be further apart. However, what unites them is the impact their leadership has had on their institutions. Sashikala quit a successful management consulting job and partnered with her husband Sanen, a former civil servant, to fulfill a life-long dream of bringing high-quality school education to their native Nagaland in Northeast India. They started from scratch, with a plot of land bought with their savings and a project-plan that Sanen wrote up for his master's thesis in education leadership. Ten years later, their Maple Tree School is now a happy space buzzing with six hundred children. Taught through a skill-focused curriculum, these students have built a drip irrigation system to tend to their own vegetable farm, illustrated graphic stories of orphaned sisters and raised funds to care for an ailing staff member. Inter-school competition prizes and stellar board examination results prove that these small-town children are at par with their peers in bigger cities. Urmila started questioning the system after spending decades in teaching and administration at some of the country’s most elite schools. 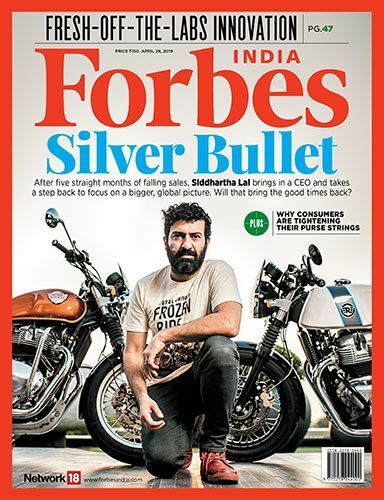 Experiencing the struggles of poor children trying to fit into private schools, who had grudgingly admitted them against free seats mandated under the Right-to-Education (RTE) Act, was a turning point. She now manages the transformation of three government schools under a public-private partnership between the South Delhi Municipal Corporation and educational NGO Peepul Education Foundation. Once deserted by parents, the schools have seen a dramatic rise in enrollment. While millions of their peers in other government schools struggle with basic skills, these children can read grade-level texts, converse confidently in English and understand tricky number concepts. More importantly, they enjoy coming to school, are self-disciplined and know how to stay safe in the city. Over the last decade, I must have spent several hundred hours inside schools. Most school owners and principals I have met, are incredibly hardworking and individuals with good intentions. However, only a handful of them are able to consistently raise outcomes for all children. Research has repeatedly proven that out of all in-school influences on student learning, leadership is second only to teaching quality. However, survey data reveals that schools across the world, and especially so in India, are bogged down by ineffective management practices. Unsurprisingly, we have a crisis of learning in our country. Nick Bloom and colleagues at Stanford University collected data on management practices in more than 1,800 secondary schools in eight countries, including India. Then they benchmarked these institutions on four critical parameters – operations, monitoring, target setting and people management – contextualised to school education. The good news is that schools with high management scores deliver superior educational outcomes. Their analysis shows that one standard deviation increase in school managerial quality correlates with a 0.2 to 0.4 standard deviation increase in pupil outcomes. However, the bad news is that school management practices across the world lag far behind management in other industries, such as hospitals and manufacturing firms. 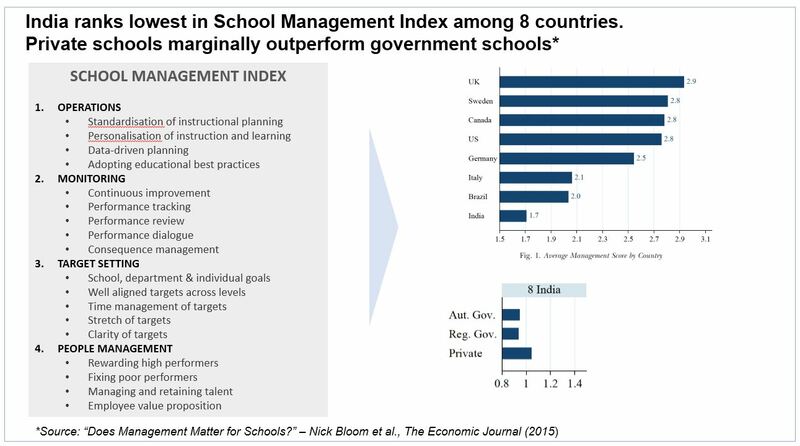 Sadly, Indian schools rank at the very bottom of the pile when it comes to management quality, with our private schools performing only marginally better than government ones. We cannot solve our learning crisis unless we resolve the leadership deficit in our schools. Today, most leaders in both government and private schools stay trapped inside their offices in a vortex of strangulating regulations, bureaucratic paperwork and day-to-day administration. This leaves them with little time and energy to improve on what happens inside their classrooms and staff rooms. This situation must change. What we need instead is a radical redefinition of the school leaders’ work. Let us call them "Chief Education Officers" (C.Ed.Os) for a change. I use this nomenclature not to foist a gimmicky label, but to clarify their core mission. The C.Ed.O's primary goal is to uplift student learning. For that to happen, they must invest time inside the classroom to internalise the nuts and bolts of teaching and learning. Sashikala shared with me how she doubled up as an English teacher in addition to her role as the school owner to get first-hand experience. Seventy percent of Urmila's own time is spent in the classroom, demonstrating model lessons and observing teachers in action. Every school leader must have a hands-on understanding of effective teaching techniques, “big ideas” in curriculum and ways to assess learning. Such "teacher-leaders" appreciate children's learning needs and prioritise them over adult conveniences in allocating resources. Armed with this understanding of good learning, the C.Ed.O must then nurture good teaching – by recruiting the best teaching talent and continuously honing their skills. "We look for passion and energy rather than years of experience," Sashikala said when I asked about how she hires her teachers. She went on to elaborate how she uses demo-classes and group activities to assess teaching and interpersonal skills. Urmila spends time every week developing her teachers – sharing constructive feedback, planning lessons together and conducting skill workshops. Research shows that when the principal's core priority is to coach teachers to become better instructors, student learning improves dramatically. Roland Fryer of Harvard University conducted a study where principals were taught how to utilise lesson planning, data-driven instruction and classroom observations-feedback (using a 6-step protocol designed by Paul Bambrick-Santoyo). After just one year, Fryer found that principals in the treatment group improved student learning by seven percent. Effective teaching can only sustain when leaders nourish the right school culture by setting a personal example of what matters most. Sashikala maintains an open office where teachers and parents walk in without hesitation. Teachers sit in each other's classes to observe and share feedback openly. "We have a lot of fun together," Sashikala says. "If teachers are happy, the rest falls into place!" Urmila confronted a school culture ridden with excuses for why children in government schools cannot learn and why they relied heavily on fear mechanism as a tool to discipline children. By personally holding high expectations for every child, setting positive classroom norms and educating parents, she showed that it was possible to shift habits. When new habits take root, beliefs start shifting. No matter how uplifting the stories of Sashikala and Urmila are, we must recognise that instilling school leadership at scale cannot be left to the initiative of a few inspired individuals. We must design policies to systematically attract talented people into the job and nurture them with the right training. Government must first ease regulations that stand in the way of entrepreneurs starting new schools and academicians running existing ones. Quality entrepreneurs will move in when fewer licenses are required to set up private schools and public-private partnerships are encouraged. Principals – in both government and private schools – will focus their energies on the classroom when they are less burdened by compliance paperwork. We must also institutionalise school leadership development, with the same zeal with which we have nurtured the venerated Indian Institutes of Technology and Management. The world’s highest-performing school systems have all systematically invested in school leadership development programs. Singapore creates a specialised “leadership track” for teachers and assigns them specific responsibilities in school improvement. In Shanghai, aspiring principals receive extensive curriculum and instructional leadership experience as part of their initial teacher training and development courses. Ontario runs a rigorous Principal Qualification Program as a “gateway” to school leadership. We must learn from these successful programs. India has close to one and half million schools. We need a mission of national priority to inject every one of these institutions with a Chief Education Officer of substance – skilled in classroom improvement, teacher preparation and institution building. Only then can we can even begin to realise the great promise to unleash the learning potential of our quarter of a billion children.